Note: This post is going to discuss representations of psychiatric abuse in pop culture. Have you ever watched a genre-show where the main character is one you know, for certain, is sane, because you’ve been watching them for a season and a half, and yet the episode opens with them being in an asylum, accused of heinous crimes, drugged up, and undergoing treatment they scream their way through? Whether it’s Will Riker of Star Trek: The Next Generation loudly insisting “I may be surrounded by insanity but I am not insane!”, Sarah Connor in Terminator 2: Judgement Day screaming the truth at Dr. Silberman, or Priya Tsetsang/Sierra of Dollhouse describing the asylum as “hell, I’m in hell”, storylines of characters we identify with and know are sane are pretty common. And no matter what the purpose of the particular scene is, there’s one thing all of them have in common: What happens to the character is terrible because we, the audience, know they don’t deserve it. They’re a sane person stuck in an insane asylum, and that’s what makes it creepy. Not because the shows or movies are poorly written: I am still a huge fan of ST:TNG, and Terminator 2 is still one of my favourite movies. I was not a fan of Dollhouse, but can see why many fans of the show were quite taken with Belonging. They’re also typically quite well acted, and even with my dislike of Dollhouse I gotta admit that Dichen Lachman was amazing as Sierra. No, no, I hate this plot because there’s never any real attempt to discuss that what makes this plot work is the very frightening idea that what happens to these characters would be in someway okay if they were actually diagnosed with the mental health conditions they are accused of having. 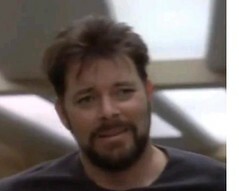 Image: Will Riker, out of uniform and scruffy looking, walks down the corridors of the Enterprise insisting he’s sane. In the Star Trek: The Next Generation episode “Frame of Mind”, the opening teaser is of Commander William T. Riker explaining to an off-screen interrogator that he’s not crazy, that he understands his actions, and that he’d like to now be released from the asylum. This scene is repeated throughout the episode, both as a scene from a play that Riker is performing with Commander Data, and as scenes from the actual asylum that Riker has been forced into by the antagonists of the episode, the hospital administrator on Tilonus IV. Throughout the episode we see scenes of Riker being taunted by the staff at the asylum. We also see a few other inmates, with the implication that these people, unlike Riker, are actually crazy, since one of them uses a spoon to attempt to contact Star Fleet. Finally, we see Riker strapped down, forced to undergo treatment that will permanently alter his personality and change him into a different person. In the end, he’s rescued by his shipmates. There’s some implication that the asylum may be shut down, but it’s not clear by the ending. ST:TNG was pretty episodic, and only rarely touched directly on previous episodes. (This isn’t a criticism!) My issue isn’t really with the fact that the Enterprise may have warped away from an abusive asylum without a second thought, since that wasn’t really the point of the show. It’s just that this episode is pretty much predictable in how it plays out, and manages to reinforce the idea that yes, what happens to Riker is terrible, because Riker isn’t crazy. I really enjoyed this episode when I first watched it, and thought it was very powerful. Since then, I’ve become a lot more aware of forceable institutionalization and the practice of forcing people into Electroshock Therapy against their will, and the episode is a lot less enjoyable. More recently, of course, is Dollhouse and “Belonging”. I was actually asked to watch and review this episode when it first aired. I watched it with a few friends who weren’t familiar at all with Dollhouse and found the entire idea of the show – Wikipedia sums it up as “The show revolves around a corporation running numerous underground establishments (known as “Dollhouses”) across the globe which program individuals referred to as Actives (or Dolls) with temporary personalities and skills. Wealthy clients hire Actives from Dollhouses at great expense for various purposes” – very very creepy. I ultimately ended up not reviewing it because the episode left me so angry and drained that all I wanted to type was “arg arg arg arg I hate you show I hate you”. I have some distance from that now. Image: Topher and Sierra from Dollhouse. Topher is dressed in “regular” clothes, while Sierra is in a hospital gown, her hair disheveled, and obviously quite distressed. In this episode, it’s revealed to the audience that Sierra was sent to the Dollhouse to become an active because she was diagnosed with a mental health condition. Topher describes it to another character, Boyd, as “I helped Sierra, you know. She was a paranoid schizophrenic, psychotic. I helped her.” This idea of having “helped” Sierra is very important to Topher’s sense of self. When it’s later revealed that Sierra wasn’t actually psychotic, but had been drugged to the point of appearing that way, that’s when Topher suddenly believes that tying her down to a chair and forcing her to undergo painful treatment that she kicked and fought against might have been a bad idea. Because doing that to an actual crazy person is okay, but doing it to a sane person is wrong. As I said, I wasn’t a fan of the show, and this was the only episode in Season 2 I watched, but I did follow what else happened in the series. I know that this is a pretty pivotal episode to Topher’s arc, and it’s in realising that he’d forced a sane person to undergo this horrible treatment that he begins to really question what’s going on with the Dollhouse and what his role is in it all. I also think it’s pretty clear from the show that we’re supposed to view the folks in the Dollhouse as being people who are “morally suspect”. I still hate the episode. I hate it because there are so many genre-shows that do basically exactly this, and this episode is part of that trope. Despite the fact that the characters are presented as morally ambiguous, they’re still our point of view characters, and they’re still saying “What happened here is wrong” as being directly tied in to Sierra not having been “psychotic” in the first place.[1. I really really really want to find the time to write about the repeated trope of fear of institutionalization in Whedon’s work. It’s on my list of things. My list is long.] They’re also not unique in this view, and it’s a pretty common idea that it’s okay to force people who are “crazy” into treatments that would be considered torture if they were done to anyone else. What I hate about this trope is that it’s done all the time, it’s very rarely analyzed in a way that discusses the message of “It’s okay to do this to a crazy person, but it’s off-limits if the person is sane” as being problematic, and because it implies that these sorts of things don’t happen in real institutions. Except that, in many (but by no means all), these images are not exaggerations, but understate the amount of abuse and forced treatment. I think that this trope, like yesterday’s one about Crazy Roommates, comes from an exaggeration of the natural fear of being forced into medical treatments you don’t want because somehow you’ve lost control. The problem with this particular trope is it’s not based on fiction: this is the real experience of thousands of psychiatric patients and survivors. This is frightening to me because it’s true, and I wish that particular truth wasn’t used as fodder for genre shows to add depth to their characters. Darn. I have liked a lot of stories of this type because the trope spoke to me strongly as a criticism of the practice of institutionalising people as a form of social control. This is particularly apparent in the Dollhouse storyline, where Sierra is institutionalised because she won’t acquiesce to the demands of a rich, influential man. It seems to tie in directly in to the real-world history of institutionalising/medicalising women when they failed to perform submissive femininity correctly. When you get comments like Riker’s “I may be surrounded by insanity but I am not insane!” and Topher’s attitude changing when he realises she wasn’t really mentally ill, though… you’re right, that totally moves it into Unfortunate Implications territory. It would be nice to have a version of this storyline where the person *is* mentally ill, but it’s still presented as wrong to institutionalise them and give them (pseudo) medical treatments against their will. Thanks for opening my eyes to the wrongness here! For me, at least, it’s more that there’s so much of it, rather than any individual thing. I can pretty much guarantee that every genre-show I’ll watch will involve at least one episode of “Is she or isn’t she sane?” about one of the main characters, with of course the answer being yes. With Dollhouse, I do think that Joss was Doing Something with the episode, at least, rather than it being a throw-away like the earlier ST:TNG episode was. But he regularly deals with issues of forced institutionalisation, too. Like, there’s “Normal Again” in Buffy, the episode with Dana in Angel, a lot of stuff with River in Firefly, and of course Dollhouse in general but this particular episode in specific. So I hate it, but at the same time I really see that it’s something he’s trying to talk about, albeit in a way that I find really really frustrating. Good post, Anna; thank you for describing this so well. This trope has been bothering me, too, and even though I am a fan of “Dollhouse” and liked the episode you’re talking about, I think your criticism of it is spot-on. I like something I think the episode was *trying* to say — something Jess mentions above, about power imbalances and women who don’t acquiesce to every demand their male partner makes are considered unreasonable and “crazy” and sometimes institutionalized and forcibly medicated — and it was almost there, but the focus on “oh, no, Sierra wasn’t *REALLY* crazy!” muddled things up and made the episode a lot less powerful and awesome than it could’ve been. Loved this post, and It’s something I really hadn’t considered before. I’ve always been interested in plot-lines like this (because of personal history), but the message that “forced institutionalization and treatment is problematic ONLY IF the character is not actually mentally ill” somehow never registered with me. And now that I see it, it’s glaring. There is a Law and Order: SVU episode I watched a while back that seems to have broken the rules about these kinds of plotlines. In it, a man with unmedicated schizophrenia witnesses a crime, but he can’t testify unless he consents to being medicated. Both the man and his mother are very much against it; he is functioning well by his own standards and doesn’t want to be drugged. Ultimately, the DA and the cops somehow manipulate the situation and gets him forcibly medicated. The guy testifies and then commits suicide because all the internal voices that had been his constant companions are gone. From the ending, it’s very clear that the DA and the cops had done the wrong thing, and the everyone should have listened to the person with schizophrenia. While I would have preferred a happier and more empowered ending, I think that the show reflected the tragic things that can come of forced treatment. It’s stuck in my mind after all these years because I can’t think of another plotline like it. Re: your footnote, I would REALLY like to see your take on “Normal Again.” That episode has always, always bothered me. Thank you so much for pointing this out. Being forcibly institutionalized is one of my absolute biggest fears and from what I’ve experienced I know that it’s not unfounded. I had a run in with an institution when I was 14, at first they wanted to keep me overnight but the more they found out about my insurance the longer they wanted to keep me there. It was upsetting and horrible. I was very very lucky to have parents that knew something wasn’t right and fought them until I was allowed to go home. I have never again sought treatment or help because of that incident and I don’t know if I ever will. Rachel: L&O seems to use schizophrenia fairly often, from what I can tell. One episode that struck a chord with me from the original series is Pro Se. The defendant is highly educated–he has a law degree and defends himself–but can’t get anyone to hire him because of his diagnosis. He knows he’s prone to being violent when not medicated, but between the unpleasant side effects and the inability to use his education, he doesn’t want to be on them. At the end, he starts to lose focus at the final hearing, after which they discover that he hadn’t taken his medication since finding out his sister would be testifying against him. I couldn’t help feeling sorry for the guy–the medication didn’t benefit him at all, but he was too dangerous to be allowed not to take it. If it wasn’t for the stigma of being mentally ill, he might not have ever gone off his meds to begin with.